Adds buildings that automatically collect items on ground. 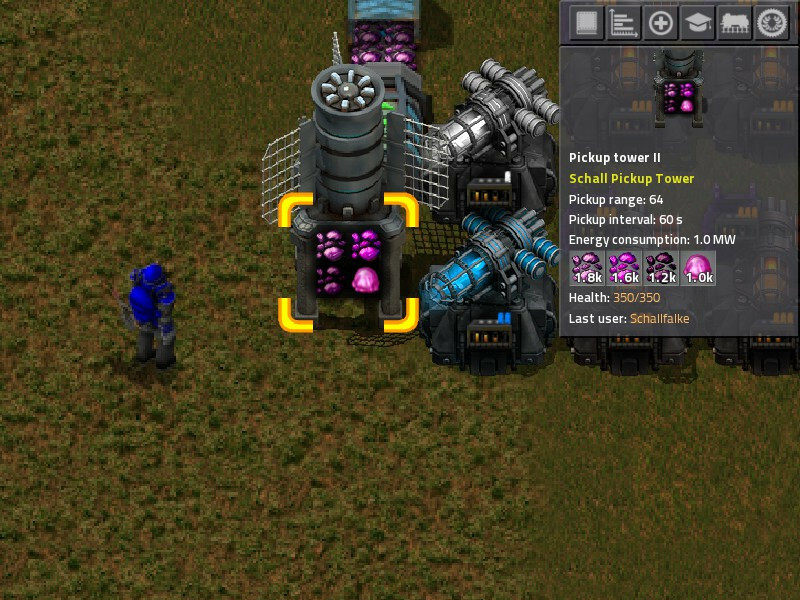 Extra building type named "Pickup tower" is introduced by this mod. It does a very simple but useful thing, collect items around the tower and put them into the storage. You can use inserters or loaders (from other mods) to put items onto the belts or logistics chest for further use. Pickup tower is unlocked after its named tech, after electric energy distribution 2 tech (substation). The tower is actually radar in disguise, although it does little in revealing nearby area. When enough power is accumulated (using the vanilla radar mechanic), the pickup command is issued. Beware do not deploy more than you need. These towers will consume more power than the radars! This mod does not use on_tick handler, so should be more UPS-friendly. Schall Alien Loot gives loots when aliens are killed. It is best to deploy the pickup towers behind the turrets, so those loots are fed into your resources line automatically! Schall Belt Configuration allows increasing the belt speed, making the belts useful even in the late-game. It also allows hidden vanilla loaders to be unlocked, ideal for taking items from pick towers. Special thanks to YuokiTani for the sprite sheet of pickup tower.